I’m a rather big fan of Vega, especially their VegaOne. They have a variety of ways to get your protein. You can go with the VegaOne which is more of a daily nutritional shake, you can go with the sport Protein which is a little higher in the protein content, or you can go with this one which has the same amount of protein as the VegaOne. The bonus here is this is like a mixture of the sport and the VegaOne, you get a couple servings of veggies here that you maybe didn’t get in the sport mix, which I like having so I can sneak a few more into my diet. I have gone this direction a bit more as I’ve been running and training harder for my 50k in August. It’s really hard to find a protein powder, in the vegan/ plant based realm, that is not chalky or tasteless. 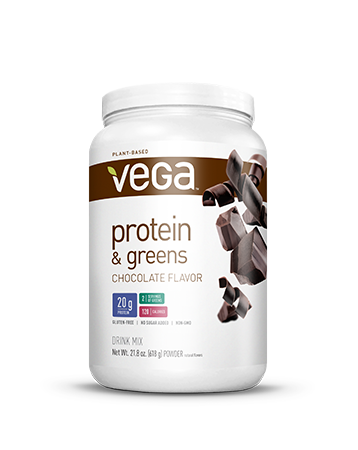 Vega’s Protein and Greens is exactly the opposite. I mix mine with only water and it tastes amazing. It’s got just enough sweetness so it’s not too sweet, but satiates the palate. I’ve read other reviews about the over abundance of stevia in the product and, on a personal level, I couldn’t disagree more. I honestly do not like stevia based products. To me, if there’s too much, it tastes very synthetic. That is not the case here as it’s a smooth flavor and the chocolate is well balanced. The mixability is amazing, just a few shakes in the ole shaker cup and it’s ready. I can’t comment on mixing with anything else, as a shake, than water though. I can tell you that I have mixed this with chia seeds to make an awesome chocolate chia pudding! Yeah I will post the recipe on the blog soon enough. I used it to help fuel me on the recent Cape Cod Ragnar Relay. Veganism, are you doing it wrong? !